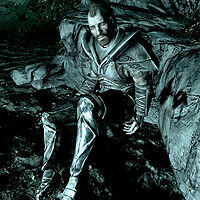 Kyr was a Nord bandit in Morthal. He was the leader of a group of bandits holed up in Frostmere Crypt however they were going through a rough patch with too few passing caravans to raid. Things began to look up for him when two new recruits Eisa Blackthorn and Ra'jirr joined their group and they made their first big find, buried chest with a couple hundred gold. After putting Eisa in charge of the dig they discovered a hidden forest underground in Frostmere Crypt. In the forest they discovered a sword on some kind of monument which Kyr kept for himself. After the sword had been removed Ra'jirr began hallucinating about the Pale Lady and decided to steal the sword and return it to the forest. Kyr assumed Eisa and Ra'jirr had stolen the sword together and put out a bounty of 100 gold for both of them. Kyr was then ambushed when chasing Ra'jirr into the forest. This page was last modified on 20 March 2013, at 04:57.